In recent years, the turbulent nature of politics in the Middle East has captured the attention of nations worldwide. Iran, in particular, has garnered more than just alarmed glances due to its aggressive foreign policy against the US, as evident in its defiant nuclear energy program and its active assertion of influence in Iraq and elsewhere in the Middle East. To many analysts the reason for Iran’s revisionist agenda is a shifting balance of power in the Middle East. Soon enough, however, Iran may find itself diplomatically overextended, facing hostilities with a superpower on its own. One may wonder why Iranian political leaders would risk such high stakes with an obstinate position against a superpower. This could be answered if one looked beyond the realist perspective that oversimplifies a complex nation’s problems into the overused balance of power equation. This paper hopes to provide another, lesser mentioned perspective on the motives behind Iranian foreign policy and looks to internal political dynamics, rather than elusive security dilemmas, for answers. By bypassing the security dilemma perspective of Iranian policies that has become so popular nowadays, we shall see that Liberal IR theory, with its emphasis on domestic interest groups, is the best analytical tool to understand Iran. Once we see the Iranian state as a representative of its political elite, and then understand the troubles and motives of that elite, Iranian foreign policy begins to make a lot more sense. Through this perspective, we see that the Iran’s aggressive foreign policies are motivated by a troubled regime facing internal challenges to its legitimacy; this regime is using a bold posture against the US, to manipulate Iranian nationalism, promote uncertainty, and in the process legitimize its monopoly on power. This paper rests on the assumption that Iranian foreign policy is indeed aggressive towards the US and its allies. Even a cursory glance of any newspaper would confirm this. Rather than dwelling on the foreign policy itself, I hope to establish the motives for that foreign policy. The arguments here will be presented in four parts. First I will construct the Liberal theory context in the Iranian scenario. Next, I will present the domestic position of the Iranian regime and its diminishing legitimacy. The third part will deal with explaining why an anti-US position is a plausible strategy for the clerical regime in Iran. Finally, I will attempt to present the above arguments in the perspective of an actually facet of Iranian foreign policy, its controversial nuclear energy program. As Liberal Theory would assume, the faqih and his Council of Guardians act based on self-interest and self-preservation, and are constrained by domestic political realities, such as falling support for their monopoly on power. Moreover, since these clerical elites have institutionalized their hegemony through the Islamic Republic’s constitution, the Iranian state has become a representative of their interests. We will soon see that Iran’s aggressive foreign policy is a strategy used by the Iranian regime through the state. In better understanding this strategy, we must now look to the Iranian regime’s position on its home front. plethora of national crises. What makes these crises relevant to our discussion is that they are eroding the Iranian regime’s legitimacy. Two issues are of particular concern here: the dwindling support from the regime’s traditional selectorate and failure of the reform movement, both of which are resulting in frustration against the regime and the consequent abatement of their legitimacy. Moreover, the working class is growing frustrated at the painfully slow rate of economic development. Economic growth in Iran, even with the influx of oil revenue, is well below expectations. GDP growth rate averaged at 2.5% from 1998 to 2001 compared to the government goal of 6%. Inflation is exceptionally high and ran at an average 15.55% from 1997 to 2001. Unemployment is currently at 16.1% and, due to increasing number of educated entrants into the labor market, is expected to hit 25% by end of decade. Demands for change in the economic and political situation of this large working class resulted in a momentous reform movement, which even in its failure, would provide a decisive blow to the already diminishing legitimacy of the clerical regime. 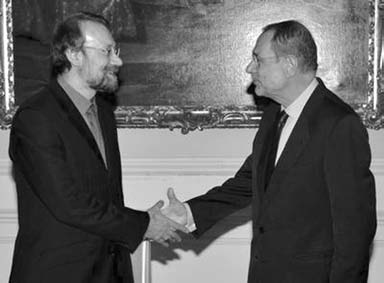 In understanding the failed reformist movement in Iran, we look to the efforts of ex-Iranian President Mohammad Khatami, who reigned from 1997 to 2005. His landslide victory in the 1997 presidential election is often credited to his sweeping reforms agenda. With his promises to promote civil liberties and “democratize the theocracy,” he won mass appeal with Iranian youth, while his liberal socio-economic agenda secured the support of the powerful middle class. Once in power, his government proposed several laws to secure civil liberties, place checks on the faqih and his Council of Guardian, make the budget-making process more transparent, and wrest important government departments (such as the Foreign Office) away from the clerics. Not surprising, the Council of Guardians vetoed almost all the reformist legislation and most of Khatami’s prerogatives failed.5 As he left office in 2005, he took with him reformists’ hopes of changing the system from within. As a result of Khatami’s failure, now reformist propaganda seems to be against the regime as a whole, and nothing symbolized this better than the boycott of the subsequent presidential elections. Whereas there was a 70% turnout in the 1997 elections that brought Khatami to office (80% of the turnout was in Khatami’s favor), the 2005 presidential elections had a turnout of 30-50% (the lower-limit being counted by boycotters, and the upper-limit by the government), out of which the regime loyalist candidate, Mahmoud Ahmedinejad, won a 60% victory. This means that the electoral support of the regime-backing executive may be as low as 20%. Nonetheless, many dissenters note that it doesn’t matter whether the president and parliament are reformists or hardliners. The shadow clerical elite on top remain the same. Ladan Boroumand notes in her analysis of the Iranian elections, “In terms of who actually holds power, the elections mean nothing: the de jure winners were already the de facto rulers anyways.”6 The failure of the reform movement, the resulting frustration with regime displayed in the apathy towards the most and perhaps only democratic component of the Iranian political system spells out the declining legitimacy that the regime faces at home. Returning to our Liberal Theory model, we see how the primary interest group in Iranian politics, the clergy in government, have struggled to maintain their hold on power, primarily by fighting off reformist moves to cordon their influence and changing the social status quo which keeps them securely above the rest in Iranian society. Also, we see how the selectorate, comprised of merchants and clergymen, that once provided the political support for the regime is now dwindling. When it comes to responding to these challenges, these fundamental actors are limited by socio-political constraints. There is only so far they can go before the Iranian populace becomes frustrated enough to replace them. This is where we use Liberal theory’s predictive capabilities. Motivated by self-preservation but limited by societal influence, the fundamental actors of the state are bound seek strategies which can be used to sustain their political hegemony. Here we stumble upon the motives of these actors in playing their high-stakes adventures in foreign policy. Indeed, rather than dealing with these structural problems, which they cannot deal with from within the current system, they seek out problems that they can deal with. As it turns out, the regime’s strategy in dealing with its lack of legitimacy involves an astute manipulation of nationalism and uncertainty, political forces that are well-ingrained in Iranian society. Let us now explore these Iranian perceptions and attitudes towards the U.S, and more importantly how they can be used to the regime’s advantage. Therefore, when the clerical regime stands up to the US in foreign policy issues, may it be in mocking Israel, supporting insurgents in Iraq, or pursuing a nuclear energy program, the regime puts itself at the helm of one thing that all Iranians, from reformists to minorities stand behind, and that is nationalism. As long as the regime can align itself with the powerful forces of Iranian nationalism, the Iranian people are less inclined to move against it. A potent example of how the government has been using nationalism for its own ends is by blaming most of its ethnic tensions on foreigners. Abbas Samii tells us in his article on ethnic tensions in Iran, “The central government typically reacts to ethnic unrest with a combination of repression and scapegoating.”10 He goes on to describe how two men involved in an anti-government bombing were forced to confess links with American and British security forces, even though they had committed the crimes under the flag of an ethnic rebel group.11 By linking local troubles to foreigners, the regime is trying to appeal to the broader nationalism of all Iranians (including minorities) who would more easily accept government brutality if it is to fight off foreign foes. The second social undercurrent that the Iranian regime has to its advantage is uncertainty. By using the already established image of an aggressive superpower bent on demeaning Iran, and then inflating that image, the regime propagates uncertainty, and then uses it as an excuse to stay in power. To understand this feeling of uncertainty amongst Iranians, we look to the Iranian narrative of recent history. The fact that the CIA engineered a coup to replace the democratic secular government of Mohammad Mossadeq with the oppressive Pahlavi dynasty to ensure Iranian oil supplies in 1953 is still painful memory for many Iranians. Also, President Ahmedinejad’s generation hasn’t forgotten Saddam Hussein’s brutal US-backed invasion and the lethal chemical weapons he used on the Iranian people. So when George Bush labeled Iran as part of “the axis of evil” after 9/11, and proceeded to invade both of Iran’s neighbors, the Iranians’ suspicions about the superpower only deepened. Fereydoun Hoveyda has labeled this sense of insecurity amongst Iranians as a “siege mentality.”12 Indeed Iranians have a socio-historical inclination for feeling on the defensive; this is an inclination the regime can readily exploit. Indeed, with every hardline policy approach the US diagnoses for Iran, the Iranian regime becomes more aggressive towards the US. Using its position as a defender of the Iranian people against what is seen as their natural enemy, the Iranian regime fills in the legitimacy void created by its other failures at home. Ahmedinejad, Mahmoud. Shiraz, April 16, 2007. “All at Sea over Iran” The Economist (2007) EBSCOHOST Princeton U Library: Princeton, Apr 21, 2007. Ehsani, Kaveh. “High Stakes for Iran” Middle East Report (2003) EBSCOHOST. Princeton U Library: Princeton, Apr 20, 2007. Farhi, Farideh. “Crafting a National Identity amidst Contentious Politics in Contemporary Iran” Iranian Studies. 38.1 (2005) EBSCOHOST Princeton U Library: Princeton, Apr 21, 2007. Halliday, Fred. “Iran and the Middle East: Foreign Policy and Domestic Change” Middle East Report (2001) EBSCOHOST Princeton U Library: Princeton, Apr 21, 2007. Hoveyda, Fereydoun. “Iran and America.” American Foreign Policy Interests. (2006) EBSCOHOST Princeton U Library: Princeton, Apr 21, 2007. Kupchan, Clifford. “Iranian Beliefs and Realities.” The National Interest. (2005) 108 EBSCOHOST Princeton U Library: Princeton, Apr 21, 2007. Moravcsik, Andrew “Taking Preferences Seriously: A Liberal Theory of International Politics” International Organization, 51.4 (1997). 513-23. Pilger, John. “IRAN” New Statesman (2006) EBSCOHOST. Princeton U Library: Princeton, Apr 20, 2007. Rezai, Ali. “Last Efforts of Iran’s Reformists” Middle East Report. (2003) EBSCOHOST. Princeton U Library: Princeton, Apr 21, 2007. Sahimi, Muhammad. “Leave Us Alone, Iranian Reformers Say” Progressive. (2006) 21 EBSCOHOST Princeton U Library: Princeton, Apr 21, 2007. Samii, Abbas William. “Ethnic tensions could crack Iran’s firm resolve against the world.” The Christian Science Monitor. 98.128. (2006) EBSCOHOST Princeton U Library: Princeton, Apr 21, 2007. Schake, Kori. “Dealing With A Nuclear Iran” Policy Review. (2007) 3 EBSCOHOST Princeton U Library: Princeton, Apr 30, 2007. Sherman, Steve. “IRAN” New Internationalist. (2004). EBSCOHOST. Princeton U Library: Princeton, Apr 20, 2007. Taheri, Ali. “Getting Serious About Iran: For Regime Change.” Commentary. (2006) EBSCOHOST. Princeton U Library: Princeton, Apr 20, 2007. Vakil, Sanam. “Iran: Balancing East against West” The Washington Quarterly. (2006) JSTORR. Princeton U Library: Princeton, Apr 20, 2007. Rezai, Ali. “Last Efforts of Iran’s Reformists” Middle East Report. (2003) 45 EBSCOHOST. Princeton U Library: Princeton, Apr 21, 2007. Hoveyda, Fereydoun. “Iran and America.” American Foreign Policy Interests. (2006) 16 EBSCOHOST Princeton U Library: Princeton, Apr 21, 2007. Farhi, Farideh. “Crafting a National Identity amidst Contentious Politics in Contemporary Iran” Iranian Studies. 38.1 (2005) 19 EBSCOHOST Princeton U Library: Princeton, Apr 21, 2007. Schake, Kori. “Dealing With A Nuclear Iran” Policy Review. (2007) 6 EBSCOHOST Princeton U Library: Princeton, Apr 30, 2007.